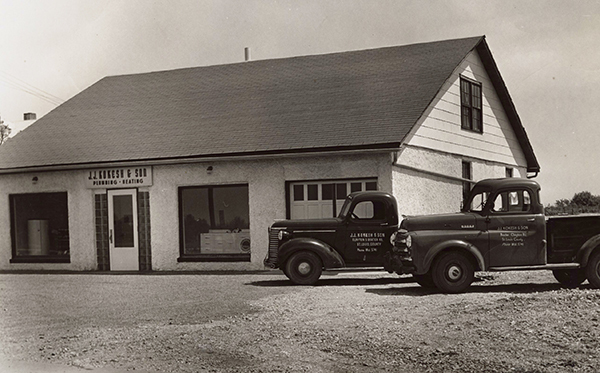 J.J. Kokesh and Son is a family-owned business that’s been serving St. Louis and surrounding counties for 125 years. It has been passed down through four generations. This lineage of soft spoken, thoughtful, knowledgeable yet daring Kokesh men started with one young, fifteen year old Bohemian stepping off the boat at Ellis Island in 1890, and heading west to St. Louis. He was a serious and creative person with big ideas. He knew he would be successful if he stuck to some solid basic principles… deliver high quality service with respect, dependability and professionalism. This formula would serve him very well. Jerry Joseph Kokesh, was no different than most immigrants in dreaming of America as the land of endless possibilities. Right away he landed a position working in a glass factory in hopes of saving enough to start his own business. Jerry Joseph, “JJ”, was a seriously determined young man who would walk 8 miles each morning to his glass factory job, work 12 hours, then walk home 8 miles… all with the sole purpose of saving up enough money. Although tinning work was in high demand for the repair of pots and pans, wash tubs, roofs and gutters… JJ recognized the future was in plumbing and electricity. At the ripe age of 19, J.J. paid $1,000.00 for 4 acres of land in an area called “Stringtown” at the crossroads of Clayton Road and Baxter Road. At this time, this corner boasted a blacksmith shop, a tavern, a grocery and a small school. Surrounding this unremarkable crossroad were farms as far as the eye could see. He built a new brick building sporting “JJ Kokesh and Son” proudly on the front. By this time, his business had expanded to include all of West St. Louis County. On May 6th, 1896, J.J married Josephine and later sired two young daughters, Georgia and Emma and a son, Edward. In 1914, his business was one of the first to buy two new service trucks with the company name emblazoned on their sides. His business territory grew extensively, needing to add employees. Being the tinkerer that he was, he invented a carbide gas machine to generate electricity for lights in homes. His patent was granted but unfortunately, a much larger company decided to establish itself as the sole provider of electricity. Not to be deterred, J.J. spotted the ever expanding need for quality residential and commercial plumbing and HVAC services. He decided the best way to establish JJ Kokesh and Son as a St. Louis industry leader was to define and implement high quality standards in their every day practices. 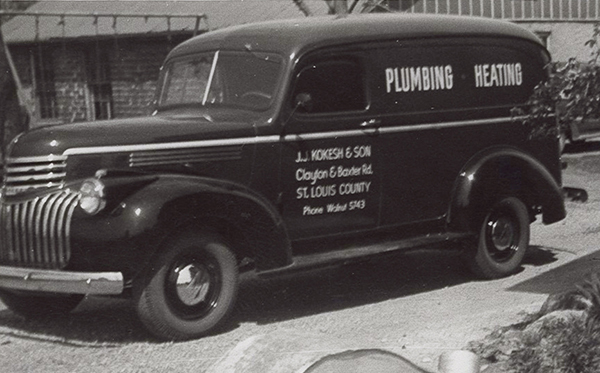 In 1927, the plumbing code went into effect and J.J. applied and earned his Master Plumber’s Association License. He had high expectations of his employees to always be dependable, professional, courteous, knowledgeable and respectful. With joining the Master Plumbers Association, he became certified, bonded and licensed. 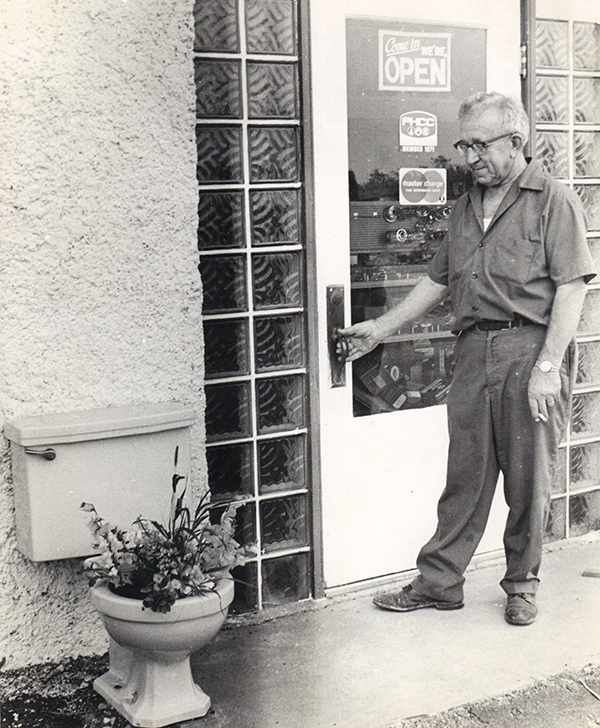 Throughout these years, J.J.’s son Edward was right alongside him digging ditches, repairing plumbing and electricity, installing heating and cooling, and learning the business. During World War II, Edward enlisted and was sent to the Philippines. He returned home in 1945 to allow J.J. to retire and take the lead of the company. His first executive decision was to delete electric work from the menu of services. It proved to be a smart move on his part because JJ Kokesh and Sons greatly expanded and even further established itself as a first class provider of residential and commercial plumbing. Edward earned his Master Plumbers license in 1948. 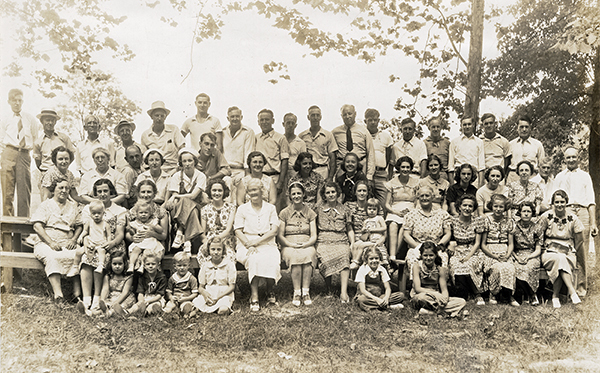 Around this time, Edward married his sweet heart Helen and proceeded to add Jerry, Carol, Alice and Larry to the Kokesh clan. It was young Larry who went to trade school during high school, with the intention of learning as much as possible to help with the family business. In 1955, Larry graduated high school, married his sweetheart, Charleen and joined the military service and was sent to Germany for the next two years. His first son, JR, was born in Germany. Upon returning to St. Louis, Larry had two more children, Beth and Joseph. Over the next 3 years, Edward and Larry made critical decisions to drop heating and cooling from their services and strictly become a Union Plumbing business. They were wildly successful and as the business grew, they found they needed to move their business to Manchester Road, and add many more employees. By 1975, Edward felt he had done his best to position Larry to lead the Kokesh brand and retire. Like the Kokesh men generations before him, Larry encouraged his two sons to ride along with him to learn the business. By the late 1970’s he had to expand to a new building further on Manchester Road to house the now 12 employees. The area was growing at a rate that could hardly be sustained. Larry continued to build his team adding Irrigation Services to the line-up. 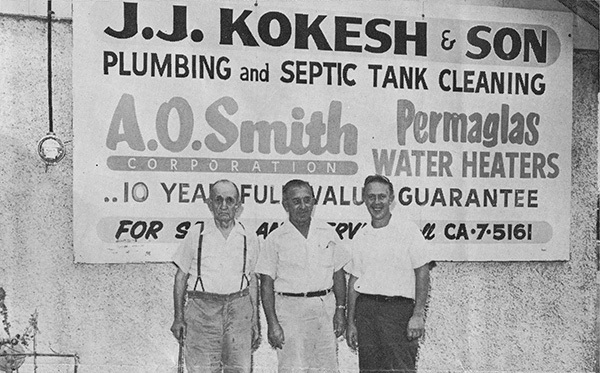 By the early 80’s, JJ Kokesh and Son had 25 employees and was bursting at the seams to handle the volume of work that kept coming in. In 1988, when the crash hit the hardest, Larry was shrewd enough to make the tough decisions to save the business by dropping down to 12 employees, deleting irrigation from services, adding light commercial work and custom home and remodeling. It was a serious time for JJ Kokesh and Son but Larry was not to be defeated. His son, JR, was right alongside him and together they held it together. 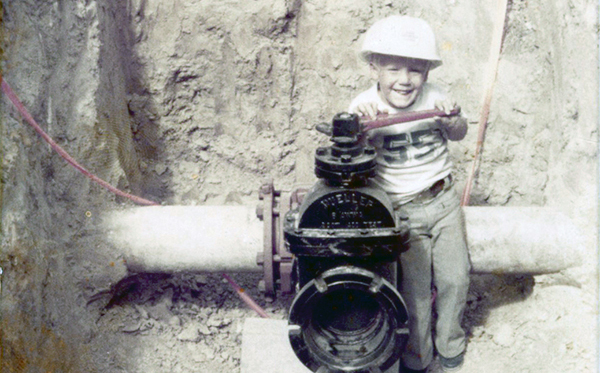 Surprisingly, it ended up being the younger son, Joe, who earned his Journeyman Plumbing license in 2005 and later earned his Master Plumber’s License in 2015. In September of 2013, Larry officially handed the business over to Joe. 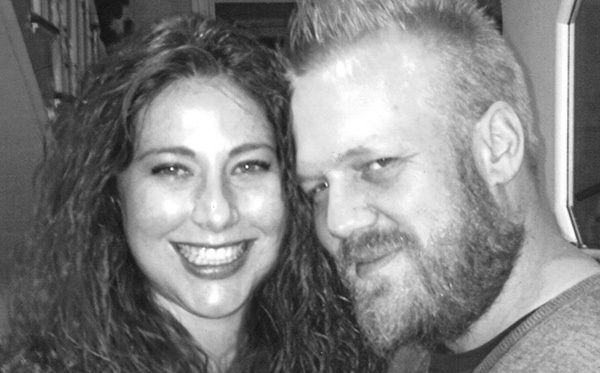 In keeping with the Kokesh tradition, Joe married his sweetheart Megan. They are currently putting their heads together to mastermind the twists and turns of the future JJ Kokesh and Son. We guess we will wait a few years before they create a future business owner for JJ Kokesh and Son. Till that time, please call for all your plumbing business. Thank you!